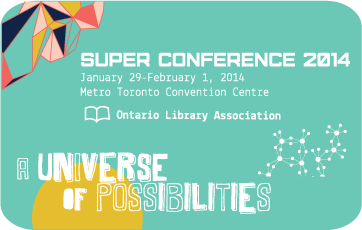 Every year the Ontario Library Association holds a huge conference in Toronto for librarians and other information science professionals. It’s a neat conference, because it has something for pretty much everyone, and this is the first year I’m lucky enough to get to go! Yesterday, I spent a whole day in a workshop for creating videos for the library. While I already knew a lot of what the instructors told us, I did learn of a few new tools I can use for video-making, which was wonderful. Tomorrow, I’m going to the conference proper, where I’ll attend a few different sessions on things like booktalking, engaging with the community, and technology for the public library. I’m even hoping I might have some time to spend at the Children’s and Youth Expo, which includes a whole host of author signings! Sounds fun! I hope you are able to make it to some of the singings!